The Rockets were just a few minutes away from their latest 4th quarter collapse and obtaining the same record as the hapless 1-7 Dallas Cowboys, their season seemingly on the brink against an Indiana team that had beaten the four times in a row, including a thrashing last April. And against a team that had spanked the Denver Nuggets on Tuesday with 144 points. For example, several players participated in a rugby scrum with about 1:20 remaining. Up 100-97, Danny Granger missed a driving layup, but Mike Dunleavy grabbed the rebound and missed, Granger rebounded it and was about to put up a point-blank layup, but Shane Battier came up with a gem of a defensive play by stripping Granger, with the loose ball getting grabbed by Kyle Lowry as he was mugged by Josh McRoberts. These guys gutted out a defensive stop when they badly needed one to stave off another fourth quarter collapse. But the Rockets weren’t very smart over the next couple of possessions. Brad Miller missed a shot with 1:02 that could have put the game away. I didn’t have a problem with the miss as much as I had with the what happened on the rebound. Kevin Martin grabbed the board, and rather than milking the clock with a 3-point lead and trying to come up with a good shot, HE PUT UP A SHOT IMMEDIATELY AFTER THE REBOUND! Luckily, the ball went in. But if he had missed that shot and the Rockets had gone on to lose the game, you can bet Martin would have gotten some heat for not playing the percentages and letting the clock wind down and setting up a play. Then another breakdown occurred with 41 seconds remaining when the Rockets fell asleep on defense and Darren Collison scored a layup easily on an INBOUNDS PASS. That brought the Pacers to within 3 points, 102-99. The last dumb play occurred with about 19 seconds left when the Rockets offense was terrible trying to come up with a set play, and resulted in Lowry just dribbling the ball on the perimeter and jacking up a low-percentage 3-pointer that barely hit the rim, if at all. That’s the best play they have with the ballgame on the line? Fortunately the Rockets played great defense on the Pacers’ final possession, defending the 3-point line well and Lowry playing great defense on Collison, who put up an off-balance 3-pointer of his own that missed. The Rockets grabbed the rebound and that was the ballgame. You can bet if the Rockets had lost this one, you would have heard a lot about the aforementioned late-game dumb plays on the Houston sports radio talk shows. These breakdowns exemplified everything the Rockets’ haven’t done to lose 6 ballgames this season after holding late leads. But you’ve got to give a ton of credit to Brad Miller, who started in place of Yao and led the team with 23 points, and had 8 boards and 5 assists. He essentially saved them (along with Martin, who had a great game with 20 points, but 1-of-6 from 3-point land). My only problem is that the Rockets offense was so absent of high-percentage plays, Miller had to bail them out with two 3-pointers in a row with 6:22 and 5:43 remaining. Those 6 points turned Houston’s 90-87 deficit to a 93-93 tie and kept them in the game. You’re telling me having your backup center put up 3-pointers, who was 1-for-3 on treys for the SEASON, is your best option late in a game to save you? Man. Thank God for Brad making shots when no one else could come up with one. What this does tell you is that all the people on Houston sports radio who were saying after the Rockets’ 1-6 start that GM Daryl Morey hasn’t done anything can shut up for awhile. After all, it was Morey who signed Miller this off-season. It was Morey and his staff who were able to make a deal a couple of seasons ago for a relatively unknown backup PG out of Memphis named Kyle Lowry, and signed him to an extension this off-season rather than lose him to free agency. Lowry willed his team to a victory with 13 points, 6 rebounds and 7 assists, and gave them the toughness they needed. He even took a blow to the head on a pick from a McRoberts elbow and managed to gut-out 34 minutes on the court with hardly any playing time this season because of injury and back spasms. What a winner this guy is (notwithstanding jacking up that ill-advised late 3-pointer that missed). Just when you think the Rockets are done losing to mediocre teams (like Memphis, the Clippers, the Wizards, etc. ), they end up losing to a bad Indiana team (107-102) for the second time this season. Yep, folks, the Rockets were swept this season by a 15-27 team in the Eastern Conference. Embarrassing. Sure, Yao banged his knee in the first half (it’s not serious, he’s day-to-day) and he didn’t play in the second half as a precaution. But still, this is a tough loss to take, even with “The Big 3” of Yao, Tracy McGrady and Ron Artest out of the lineup. Before Yao exited the game, he wasn’t having that great of a performance. In 17 minutes, he was only 2-for-7 for 8 points (blocked twice by Danny Granger in the game’s first 2 minutes), and had 3 turnovers. But him not being in the game in the fourth quarter left a big gaping hole down low on defense. Yao Ming winces in pain during the Rockets-Pacers game. Luckily, his knee injury isn’t serious (x-rays were negative), and he’s day-to-day. Click here for more photos. The Rockets’ defense was pretty bad most of the game, allowing lots of easy baskets around the rim. The Rockets’ young guys of Von Wafer, Carl Landry, Luis Scola and Aaron Brooks may be great scoring threats, but they still have lots of work to do with the coaching staff in not blowing defensive assignments. Even then, though, the Pacers still shot a poor 39.3% from the field, which was lower than Houston’s 43%. But it just seemed the Rockets couldn’t stop the Pacers when it really counted. Scola, though, was fantastic in the fourth quarter, helping bring the Rockets within striking distance after the Rockets had whittled a 17-point deficit down to single digits. With Yao out of the game, Scola scored 15 points in the fourth, and 25 overall. He did miss 4-of-11 free throws, though. Carl Landry was very good with 17 points on 7-of-12 shooting, and Rafer Alston was decent with 17 on 7-of-15 shots, 8 rebounds, and 8 assists. But he had 6 turnovers and was 1-for-6 from three-point land. The Rockets almost pulled off a miracle comeback by pulling within 4 points late in the game, but they couldn’t get stops on D. You can read how much of it played out, with key plays included in the play-by-play below. The Rockets lost a tough one in Indianapolis, 107-102, to one of the worst teams in the Eastern Conference. It was a game they should have won. I’ll be watching it on my DVR later tonight and I’ll file a report a later. 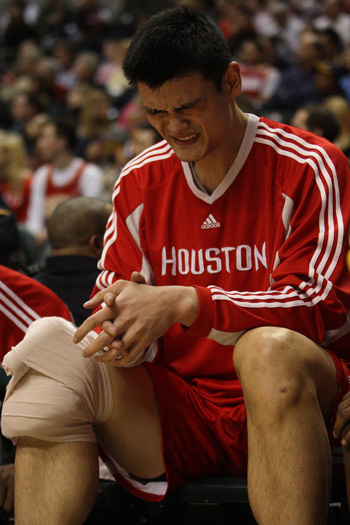 The Rockets’ chances of winning it would have been higher if Yao hadn’t hurt his knee right in the first half. He tried to warm it up at halftime, but everyone thought it would be best to rest it and get it checked out. X-rays were negative and he’s officially listed day-to-day, which is good news. So just when you thought “The Big 3” would be on the court for Sunday’s game, Yao gets hurt. Typical for the kind of year the Rockets have been having on the injury front this season. Houston’s Dikembe Mutombo celebrates during a great play in the Rockets-Pacers game which Houston won 117-99 for their 16th straight victory, breaking a 14-year old franchise record. Dikembe wasn’t needed much in the victory where 5 Rocket players scored in double figures. The Rockets took care of business Wednesday night like everyone they thought they would, winning a franchise record 16th straight game and their 20th victory in 21 games. I’m going to resist the temptation to use the over-used “Sweet 16” phrase that every media outlet seemed to use and fans who brought signs into Toyota Center. It’s just too easy. * A much bigger game against Dallas is being played Thursday night, so I’ll save my energy for that one (more thoughts about that game at the bottom of this post). With the streak, though, it’s kind of fun to watch what the national media is saying about the Rockets. Below are some screenshots from the home pages of ESPN.com and NBA.com late Wednesday night. 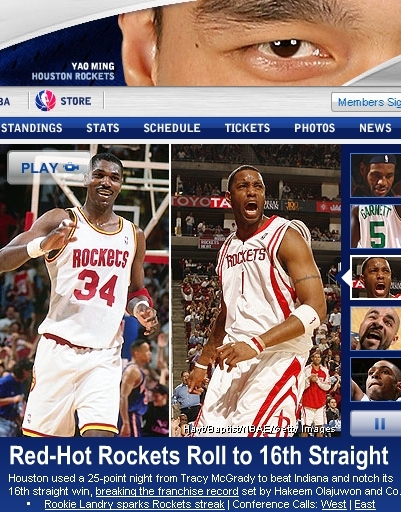 I especially like the one with the banner ad with Yao looking over Hakeem and Tracy McGrady. Kind of symbolic, huh? “This is what they do. They share,” and “Everyone on the Rockets gets involved.” ESPN even pointed out this interesting factoid from the game: 8 different players had an assist in the first half. 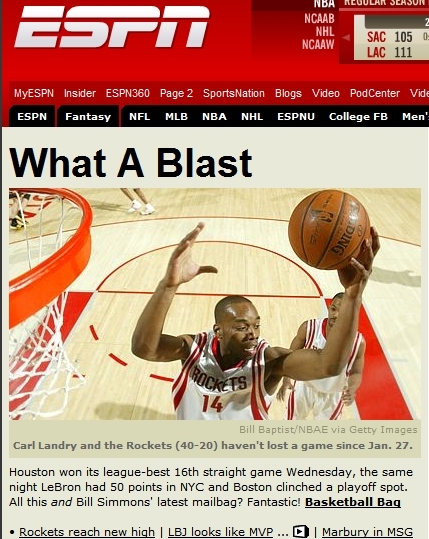 Thanks for showing the Rockets some love, ESPN. Yao Ming blocked Mike Dunleavy’s layup attempt with 4 minutes remaining in the Rockets’ game against Indiana. Although Yao ‘only’ scored 17 points in the game, this block was huge since the Rockets were still trailing at the time 99-97. Rookie Carl Landry scored a game-high 22 points to help the Rockets pull out a close game in the fourth quarter. The Rockets started their 3-game road trip in Indiana realizing the pressure was on them to win all 3 of these games against teams who probably won’t make the playoffs (Milwaukee on Saturday and Minnesota on Monday). If they don’t win these very ‘winnable’ games, the Rockets’ chances of making the playoffs themselves will take a huge hit. So you think they would come out determined to put the clamps on early against a struggling Indiana team that had lost 4 in a row and 14 of their last 18, right? Not so. They ultimately got the job done by winning the game 106-103, but the star who pulled them through wasn’t Yao or Tracy McGrady. It was rookie Carl Landry, who came back to the state where he played college (Purdue) and was a monster in the fourth quarter. Rarely do you see a rookie make his first homecoming (of sorts) and be the X-factor in a game in front of his college team’s fans, former college coaches, and teammates. But that’s what Landry did. Landry scored 22 points on 9-of-11 shooting, including 5-of-6 in the fourth quarter and 3-of-4 from the line for 13 points. There is no doubt there is something really special about this kid. That’s what we had heard from the Rockets’ coaching staff and teammates about Landry in practice while he bided his time on the bench earlier this season, and by what he has showed us over the past couple of weeks since getting some playing time. Yao towers over Jermaine O’Neal in a closely contested game where the Rockets broke free from a lackluster showing and finally pulled it out in the fourth quarter, winning 86-76. Yao was awesome, scoring 32 points and grabbing 14 boards. Click here for more photos from the game. Click here for pre-game photos of Yao practicing before the game. After beautiful offensive games where they had scored over 100 points in six of their last 7 contests, the Rockets finally had a game where they sputtered offensively, including lots of missed layups and shots around the basket. It’s strange how some of the Rockets’ stinkers have occurred at home. But Houston overcame a lackluster performance on national TV against a sub-par Indiana team, turned on the juice in the game’s final minutes, and won 86-76. That’s what good teams like Dallas, San Antonio and Phoenix do. They can sleepwalk through a game and struggle offensively, but have their superstars kick it into a higher gear to win it down the stretch. That’s what happened Tuesday night with the Yao/T-Mac combination. I’m not as upset as others may be with the Rockets’ lackadaisical showing on Tuesday. The Mavericks and Suns have been known to do it. And there are still 14 games to go before the playoffs, so if they played every night like they did against Philadelphia the other night and won by 50 points, there would be nowhere else for them to go but down. Now if the type of game they had on Tuesday night against Indiana occurred in the final week or two of the regular season as they are tuning up for the playoffs, then I would be more concerned. But more importantly, the Rockets are going to have to stick with the players they already have. It’s not going to change before the playoffs, so we just have to get used to the fact that T-Mac, Rafer Alston, and Luther Head can struggle on any given night (more on that later), meaning a first or second-round exit in this year’s playoffs. I have been out-of-pocket since Yao got injured over the holidays, so I wasn’t able to watch Tuesday night’s 81-76 loss to the Indiana Pacers (and probably won’t be able to watch Wednesday night’s game against the Nets in New Jersey). As expected, without Yao the Rockets lost to Indiana, but the good news is that Tracy McGrady finally played after missing the last 7 games because of back spasms. T-Mac scored 19 points (7-of-22 shooting), but played 39 minutes and ran out of gas at the end of the fourth quarter when the Rockets had a chance to tie the game by missing 3 shots, and turning the ball over a couple of times (7 TO’s overall). I’m not too disappointed, though, since it’s good to have at least one superstar back in the lineup. If you have gotten over your depression about Yao being out (I’m still struggling with it), and are still interested in the details of the loss to the Pacers, I’ll refer you to the Houston Chronicle story about the game. Sorry I can’t get more into these games right now. With the holiday break occurring creating a disjointed schedule for me, the Rockets not having Yao in the lineup, and T-Mac still getting his legs back, it’s tough to watch these games. Yao goes up to score two of his season-high 38 points on Wednesday night, leading Houston to a 17-point comeback win against the Indiana Pacers. Click here for more photos from the game. 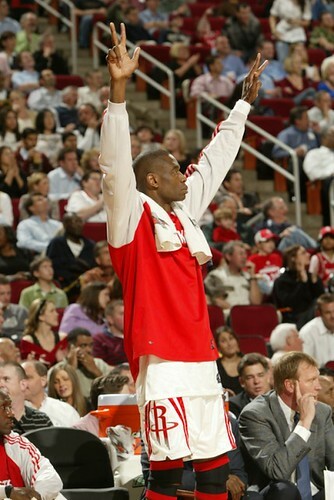 WEDNESDAY, 3/8/06 – You can’t beat what you saw Wednesday night if you’re a Yao Ming and Houston Rocket fan. Down 17 points late in the third quarter, the Rockets came back to win one of their most electric – and important – games of the season, 103-99 against the favored Indiana Pacers. Yao was absolutely unstoppable, scoring a season-high 38 points (14-of-21 from the field, 10-of-10 from the line), grabbing 10 boards and blocking 5 shots. What else can you say about him? This was his third game in a row where he had scored at least 30 points and grabbed at least 10 rebounds. He scored 20 points in the first half, and scored 13 in a row for Houston starting near the end of the second quarter and the start of the third. Needless to say, Yao knows what he’s doing down low and shooting with so much confidence, there is no way to stop him when he’s playing this well. He is playing at the level we all knew over the past four years he could reach. Hopefully he can keep it going. If he can, he could be one of the most dominant big men in NBA history. Scoring 6 points in the fourth quarter, Yao had a lot of help in the fourth with Juwan Howard hitting 2-of-2 from the field in addition to the four points he scored at the end of the third. Keith Bogans scored 7, and Stromile Swift scored six. Altogether, the Rockets shot 7-of-10 from the field and 10-of-12 from the line in that pivotal quarter, while holding the Pacers to only 4-of-25 shooting. Toyota Center was rocking like a college fieldhouse during the comeback, especially when Swift threw down a dunk off a sweet dish from Luther Head with 3:53 remaining that put the Rockets ahead 94-93 for their first lead since the first quarter! The lead see-sawed a couple of more times, and then Stromile had another huge play with 2:13 remaining. Indiana’s Scot Pollard caught a long pass on a fast break underneath the basket and was about to lay it in to put Indiana up 99-98, but Stromile came out of nowhere to reject Pollard’s shot at the rim! It didn’t look like the Rockets were going to be able to pull this game out since they committed 4 straight turnovers in the final few minutes, and gave up 4 offensive rebounds in one possession to the Pacers when Indiana was still down 98-97. After that series of offensive boards, the Rockets gave up a layup to Peja Stojakovic on an inbounds play to give Indiana a 99-98 lead. But Yao intimidated two shots by Jeff Foster and a block on the next Pacer possession. After Houston got the rebound, Rafer Alston pushed it on offense and got it to Bogans for a hard driving layup that put Houston ahead for good 100-99 with 25.3 seconds remaining. The rest of the way the Rockets held on defense and sank 4 free throws to get their biggest win of the season. What’s amazing is that the Rockets went through most of the second half without T-Mac, whose back flared up on him again. T-Mac finished with “just” 15 points in 20 minutes of action. But his teammates picked up the slack. Bogans, who replaced T-Mac in the second half, scored 14 points and grabbed 8 boards. Juwan Howard scored 16 points, and Rafer Alston dished a season-high 14 assists (and scored 5 points). Altogether, the Rockets shot an amazing 53% from the floor, 81% from the line, and held Indiana to 39% shooting. Now the Rockets will have a full 3 days of rest after winning their fourth game in a row, and their 7th win in their last 9 games. But it’s not going to get any easier. They play a brutal stretch of games against San Antonio, New Jersey, Dallas, San Antonio again, the Clippers, Dallas, New Orleans and Cleveland. This stretch of games will make or break the Rockets season. No doubt about it. I have predicted sour results before against tough competition, but with the way Yao is playing, anything is possible – even without T-Mac. To see the boxscore from the game, click here. To read the Houston Chronicle’s article about the game, click here. Yao shoots a jump hook over Indiana’s Jermaine O’Neal, but it was another tough game for Yao and the Rockets, who lost 85-74 and fell to a 3-7 record. For more photos from the game, click here. SUNDAY, 11/20/05 – Although it didn’t surprise me, I was bummed to hear that T-Mac was not going to play Sunday night against Indiana because of his injured back. Forget the fact that Rafer Alston was not going to play because of his injured leg. That really doesn’t hurt you much. But lose T-Mac with this cast of players, and you have no chance to win, especially against the Pacers. If they were going to win this game, it was going to take a heroic game from a couple of unexpected players. That didn’t happen. Heading into the fourth quarter, the Rockets had their chance, trailing only 58-52 thanks to their defense, which has been pretty decent through their recent losses. But like clockwork, the Rockets’ offense (the little that was there) gave out, and the Pacers went on a 19-4 run to put away Houston and ultimately win 85-74. Yao was only 4-for-16 until the game was well out of reach, making his last 5 shots to make his final boxscore look better than how he played: 8-for-21 for 24 points and 13 rebounds. Yao still cannot shake inconsistency, missing lots of shots down low in the paint. But you know what? Maybe Jeff Van Gundy shouldn’t be trying to force feed Yao consistently down in the lane. Maybe the Rockets need to change up the offensive attack, bring Yao out of the paint, and let him shoot those straight-up jumpers and give him a break from all of that pounding inside. He was an accurate shooter from outside in his first two seasons. Hopefully Van Gundy’s emphasis on working Yao strictly in the lane has not made him lose his touch from the outside. I don’t know if that’s the answer, but with how badly the Rockets are struggling offensively, it can’t hurt. Yao puts up a shot attempt over Indiana’s Jermaine O’Neal on Friday night. Yao scored an amazing 11 points in a row in the first quarter. He finished with 16 points and four rebounds in 21 minutes of action, limited in play because of foul trouble. The Rockets won their sixth in a row, 91-83. Click here for more photos from the game. 2/11/05, FRIDAY – The Rockets started and ended slowly in Indiana on Friday night, but in between they scored enough points to win their fourth road game in a row, 91-83, the longest win streak they have had on the road in almost 5 years. It was also their sixth win in a row, the longest current win streak in the league. The Rockets quickly fell behind 8-0 and missed their first eight shots. But they recovered and got back into the game by scoring 7 straight points. In addition, Yao was the brunt of Houston’s attack, scoring 11 straight points on an incredible array of shots around the rim, hitting 5-of-7. The Rockets took the lead for the first time with 2.2 seconds remaining in the first quarter when Ryan Bowen — of all people — hit a three-pointer from the corner to put Houston up 29-28. Man, it looks like everyone on this squad is hitting the three-ball lately. You are currently browsing the archives for the vs. Indiana category.